On one side is a small print of Justice holding a set of scales (shown here). To the other is a print of Fame blowing a trumpet. 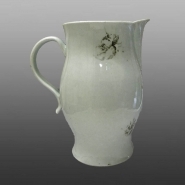 This Chaffers porcelain jug bears a rare print of the King of Prussia in court dress. Only three examples of this print are recorded. Two are signed Gilbody Maker to the left of the title cartouche and Evans Sct to the right. On this jug the Gilbody Maker has been removed. The situation that caused a print, originally engraved for Samuel Gilbody, to be used on pieces made by Chaffers and by Worcester, is discussed by Maurice Hillis in Liverpool Porcelain 1756-1804 (2011) pp 525-6.